In this recipe Banana and Toffee are the main ingredients used. So the name of this dessert is 'Banoffee Pie'. 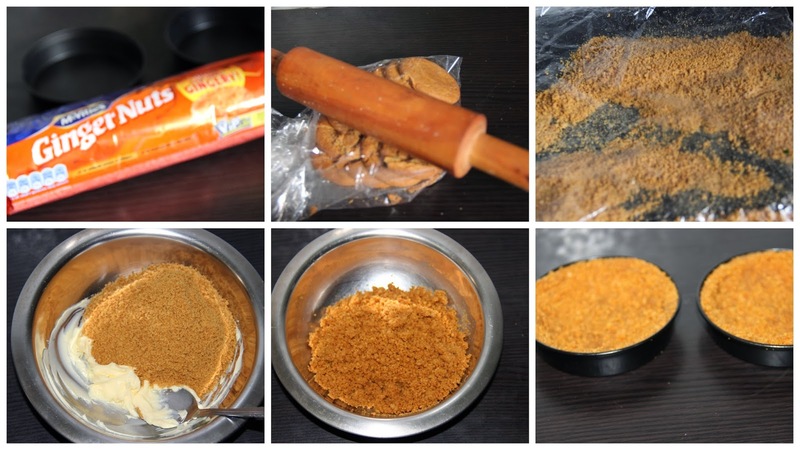 It is an easy Christmas recipe which can be prepared with limited ingredients. In this recipe you can replace caramel sauce with ready-made caramel also. The ginger biscuit base gives the Christmassy feel and the taste of caramel sauce with bananas have no word to explain. It is delicious. Whipped cream with chocolate add extra taste and make this dish attractive. A Dish you must try once. Using a food processor or a rolling pin, smash up the biscuits so they become almost fine crumbs. Mix the crumbs with melted butter. Try to roll this mixture as ball. If it holds/retains its shape then, the butter you have added is adequate enough. If it is not retaining the its shape add some more butter till it retains its shape. Press the crumbs into a tart tin. Place in the fridge for half an hour to set. Mean time prepare caramel sauce by adding sugar and water in a sauce pan by melting. Once the sugar melts keep on swirling the pan. The colour of the sugar turns to mild yellow, then when it turns honey coloured add the milk and swirl the pan to mix well. Allow to just boil switching off the gas and allow to cool. if you are not using a loose bottom tin unmould the biscuit base now. Now place the sliced banana on top of the biscuit base in a single layer and drizzle the caramel sauce on top so you have thin layer of it covering the bananas. Place back in fridge while you prepare your cream. Whip the cream with sugar and add vanilla until soft peak. Don’t add extra sugar since we have added caramel sauce in it. Chances are there your dessert becomes too sweet. Spread the cream or pipe the cream over the top. 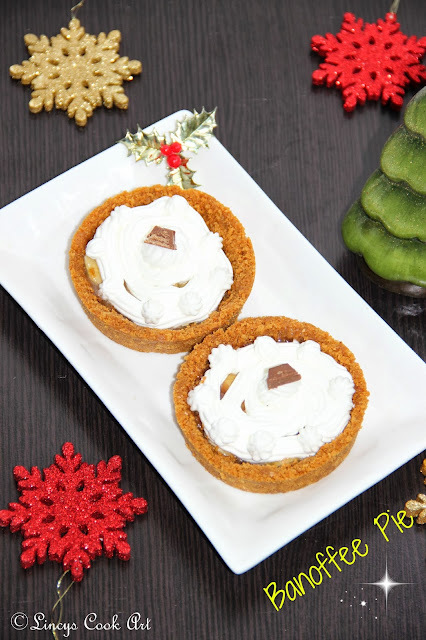 Sprinkle chocolate shavings or keep piece of chocolate on top of the whipped cream. This will keep 3 days in fridge. Note: When preparing caramel sauce don’t allow to keep on cooking once the sugar syrup reaches honey colour. If you over cook it. The sauce turns bitter. Here I have used English tartlet tins. You can use frilled fancy or any normal vessel like tiffin boxes to make this recipe. Increase the quantity of ingredients used depending on the capacity of the vessel. 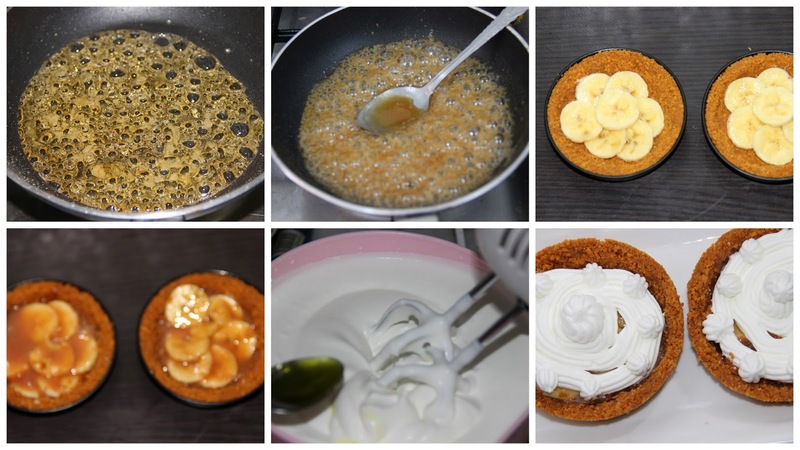 Large tart tin would require 500grams of biscuit, 5tablespoon butter, 3bananas, 400 ml whipping cream. One of my fav dessert, infact the most popular dessert among my friends ...lovee it..easy and yumm. First time here. Glad to follow your blog. Hope you will follow my blog. This pie looks interesting...and your explanation was really helpful. Madly give votes to no bake goodies..love this n banana flavourful smelling up to here.. These look so very delicious.